May the Force be with you on this lovely May the 4th! I mean, the Force is with me all the time, because every day of my life is Star Wars Day, but this little holiday is still fun, seeing what tributes people conjure up and, my favorite part, how many new items and sales various websites will have! I’ve actually already participated in one of those online sales because they started early yesterday! And shortly, thanks to a May the 4th special, I will have Sabine Wren and Ahsoka Tano from Star Wars Rebels!! They went on sale exclusively on Hallmark.com yesterday, just a day early. 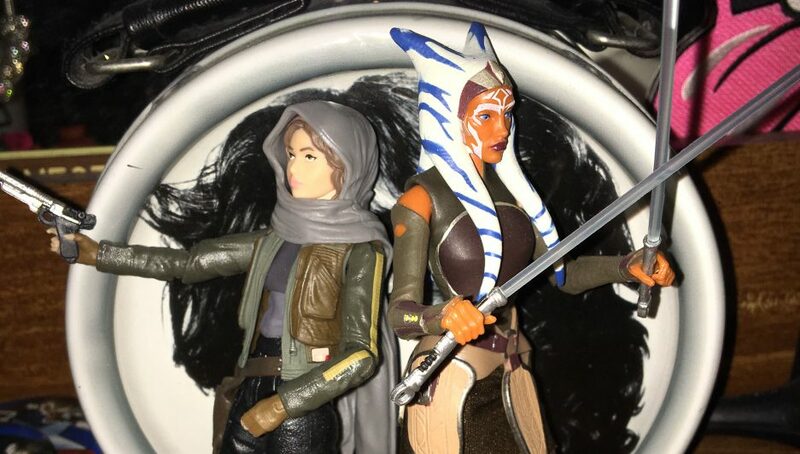 My girl Ahsoka is super popular, and Sabine is getting up there as well, so I didn’t hesitate to order them when I first saw that they were finally available. THEY LOOK SO CUTE!! I CANNOT WAIT FOR THEIR ARRIVAL! AND THEY WILL LOOK SO BEAUTIFUL WITH MY ITTY BITTY REY, LUKE, OBI WAN KENOBI, C-3PO, AND THE LONE JAWA! That’s pretty damn adorable, if you ask me. I can’t wait to see what else in this special anniversary box!!! I would like to write this tremendous piece about how much Star Wars means to me and what my favorite moments are, but sadly, I just don’t have the time. I barely have time to write this now…and quite frankly, I’m only half sure why I even bother; I know nobody cares about this blog but me, but also, it’s fun to do these little projects for myself and focus on the things I love for a little while. I have been trying to organize this site a bit more, though; I’ve compiled everything I’ve written (I think?) on this site about Star Wars and put it all in a folder called…Star Wars!! Same for Disney, Marvel, Rock and Roll, and a few other things. So, if you’re really that bored, you can delve further into this obsession that’s enriched and consumed my life by checking out that particular folder!